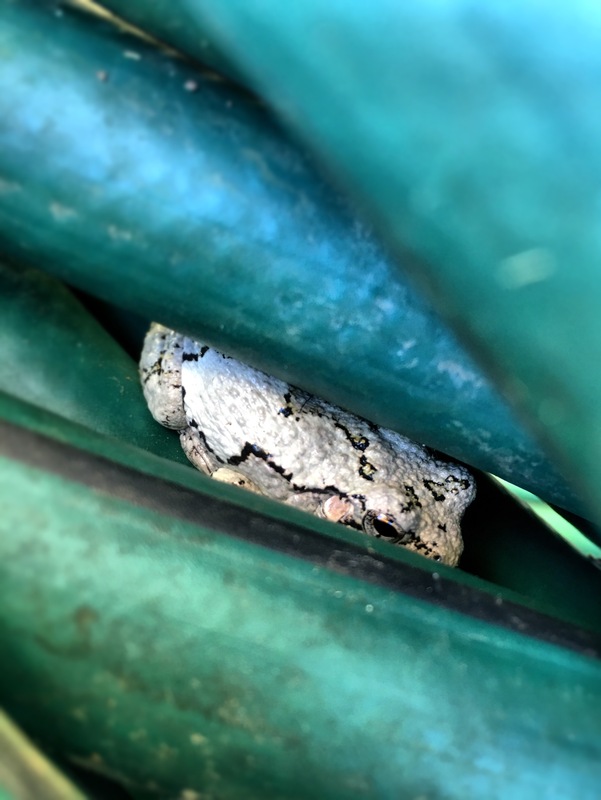 A Cope’s gray tree frog waits for nightfall in my garden hose. The other day I discovered this guy nestled among the coils of my garden hose. I put down some new grass seed last week, and set about the tedious task of watering. The frog was hiding deep down inside, but didn’t seem frightened to be found. I looked up what type of frog he is, never having seen one of them before. I learned it’s a Cope’s gray tree frog, and not endangered in New York. Resembling tree bark, they actually freeze in the winter time thanks to a chemical in their bloodstream, and thaw out again come spring. It was quite a surprise to think anything would want to live in such a place. But the frog doesn’t know it’s a hose, or that he may be uncovered at any moment. To him, it is a cool, damp place to hide from the heat of the day and await the arrival of all the bugs drawn to my back porch light at evening time. I am very careful with my hose now when watering the grass seed, gently uncoiling and recoiling it, not knowing exactly where the frog might be found. I look forward to finding him though, not very well camouflaged, but still trying to hide in plain sight.